Hans Reichel, guitar; Achim Knispel, guitar. The music is heard as it was played (no pedals, no overdubbinbs, no echoes, no tricks). Recorded in Wuppertal on 11-13, June 1977. 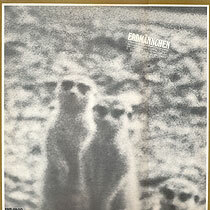 Front cover photograph (reproduced above) by Hans Reichel (at the Wuppertal Zoo). Many thanks to David Keffer for providing all this information.